Phew, another day is over. I'm very much looking forward to the weekend so I can relax a bit. I am planning to do as little as possible - mainly I just want to rest and craft. Do you have any extra plans for the weekend? I used different ribbons from Crafty ribbons - I used heart string in red colour, 6 mm grosgrain ribbon and black 25 mm sheer ribbon. I also used a border punch. The red dp is from Folia. I cut the hearts free-hand out of white cardstock. I hope you will come and play with us! :) There's also a wonderful prize to be won. 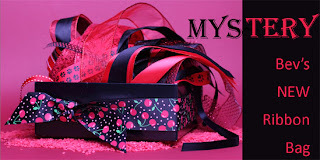 The winner of my blog hop prize is Cathy Lee. Congrats hun! :) Please e-mail me with your address to claim your prize. This is very romantic and striking Cebelica, I love it. Wow Cebelica this looks so rich and elegant also sultry and romantic, perfect card for love. Beautiful card - I love your rose-paper! Still happy with your new job??? The card is gorgeous. I love the die cut border and the fun two lil hearts. Thanks for playing along with us at Paper Play. Adore that sheer ribbon - beautiful card. Thanks so much for playing along with us at Paperplay this week. Fantastic colour combo, your card is very elegant looking. Thanks so much for playing along with Paperplay this week!! Wow! very striking!! Gorgeous card!!! the rose backing paper is so pretty and I love the string of hearts!